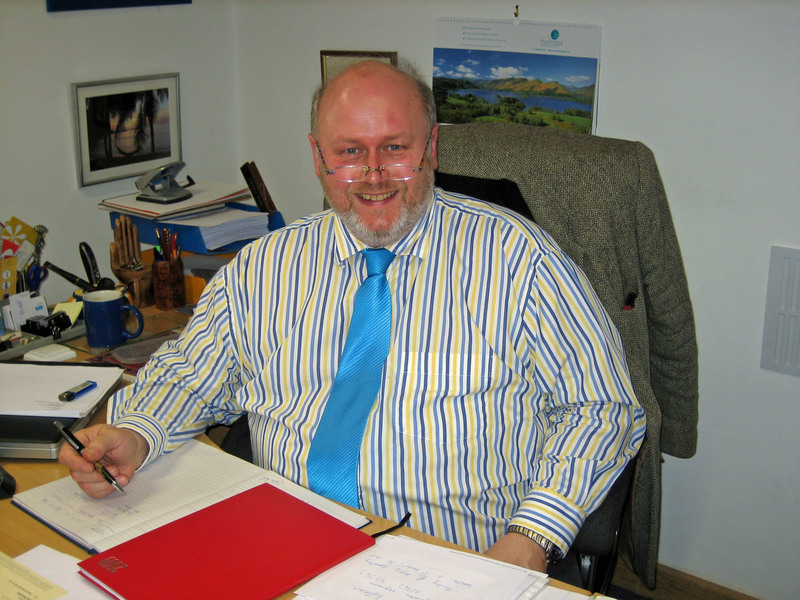 Chris Lawson, partner of Lawson Commercial asks – Is Wealden Bucking The Trend? Colliers International has just produced the first Footfall Focus report which concentrates on High Street footfall in the U.K. Their report shows that, excluding London, High Street footfall has fallen on average by more than 10% in 3 years and that footfall on primary High Streets has fallen at double the rate of that for secondary streets albeit from a much higher base. Examples quoted over the last 2 years show that footfall has fallen by up to 25% in some High Streets including Commercial Street in Leeds and Eastgate Street in Gloucester whereas in locations such as Regent Street in Swindon and Commercial Road in Bournemouth footfall flows have actually risen by up to 7%. According to the report there are huge differences in footfall between the strongest and the weakest High Streets suggesting that local factors may be as important as national ones. There is no doubt High Street are suffering from a combination of stalled national economic growth, the ever increasing rise in online/web-based spending, some multiple branch consolidation and the impact from the growth of supermarkets. However the impact of local factors is interesting. The demand for retail premises in the Wealden area remains strong and currently we have less shops available in Uckfield. Heathfield and Crowborough than we did 2 years ago. Whilst there may well be retailers who are suffering this is not translating into a high volume of available premises. The Wealden towns tend to be smaller and therefore the proportion of independent traders to multiples is much higher. Could it be that one of the significant factors is that local non-multiple retailers are more innovative and entrepreneurial than their multiple competitors? The other important local factor is that Wealden towns benefit from free car parking. In travelling to one of the larger towns such as Tunbridge Wells or Eastbourne a shopper has to consider not only the fuel cost involved but also high car parking charges. Dr Richard Doidge, Director of Research Consultancy at Colliers International commented: ‘Footfall is a good but under researched measure of the health of a centre. Levels have fallen along most of our High Streets in recent years, especially outside of central London, mirroring the trends and other indicators such as voids and rents’. The report does not have any research information about the Wealden area but it is an interesting topic. Could it be that, in the current economic downturn, Wealden is bucking the trend with shoppers supporting their local stores at the expense of the multiples in big towns? Lawson Commercial has just been instructed to market a factory in Victoria Road, Burgess HIll which sadly has been badly vandalised. It offers just over 8,500 sq ft including some 1st floor offices and is available at £350,000. The price reflects the need for significant refurbishment but provides an excellent opportunity for the right occupier. Call today for more information and to arrange to viewing. 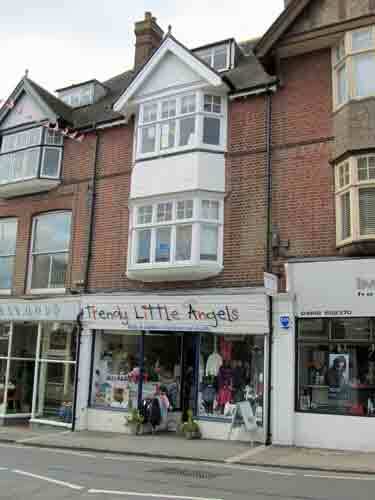 Tucked away just off Uckfield High Street is a 2-storey office building with a small garden. Lawson Commercial have just been instructed to let Caxton House at the rear of 140 High Street which comprises 1,792 sq ft of good office accommodation with an area of land at the back which, with some work, could be converted into a delightful little garden, Ideal for a businesses with a canine team! The property is available on a new 5 year lease at a rent of £12,500 pa. For full details call us on 01825 764488 or email through our contact page. 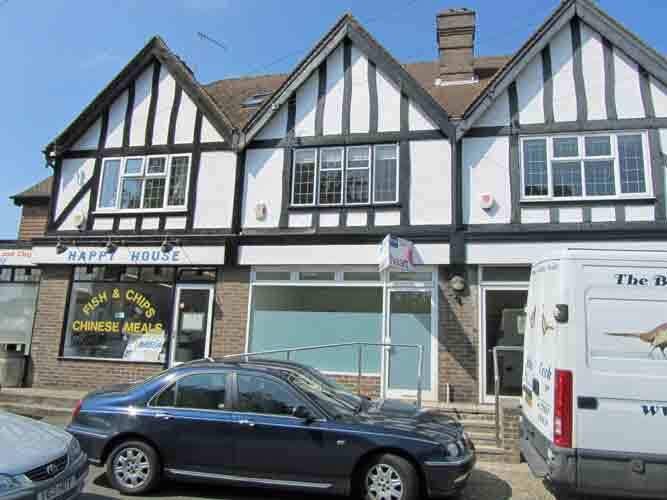 Lawson Commercial have just received instructions to market a retail and office investment at 4 The Broadway/Thorpe House Croft Road, Crowborough. This comprises a shop in The Broadway with self-contained offices on 3 floors above and accessed from the rear off Croft Road. The upper parts would be ideal for conversion to a flat if offices were not required and are becoming vacant at the end of the year. The total actual & projected rental is £18,500 per annum and offers are being sought in the region of £200,000 showing a 9.25% return. For full details call us on 01825 764488 or email through our contact page. Mike Skinner, Chairman of Uckfield FM Community Radio, thanked Chris & Julia Lawson of Lawson Commercial for organising the Inaugural Uckfield FM Radio Awards on Thursday 13th October at Buxted Park Hotel and presented Julia with a bouquet and Chris with a bottle. The event was hosted by Malcolm Diamond MBE, chairman of Trifast plc (TR Fastenings) one of Uckfield’s leading industrial companies and the awards were presented by Mrs Kathy Gore DL, High Sheriff of East Sussex. Chris Lawson said he and Julia were proud to support Uckfield’s community radio station which does a great job. The Awards event was not only a fund raiser for the station but also a way of recognising the tremendous professionalism, dedication and enthusiasm of the 24 presenters and 8 backroom staff. The Station only has one and a half employees everyone else being a volunteer with the majority also having a full time job or being in full time education. 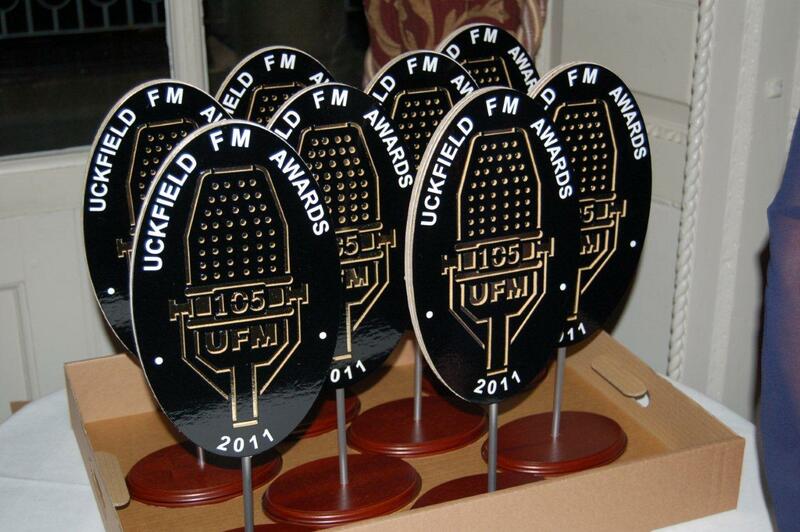 Uckfield FM relies on grants, revenue from radio ads, sponsorship and fund raising to keep going. 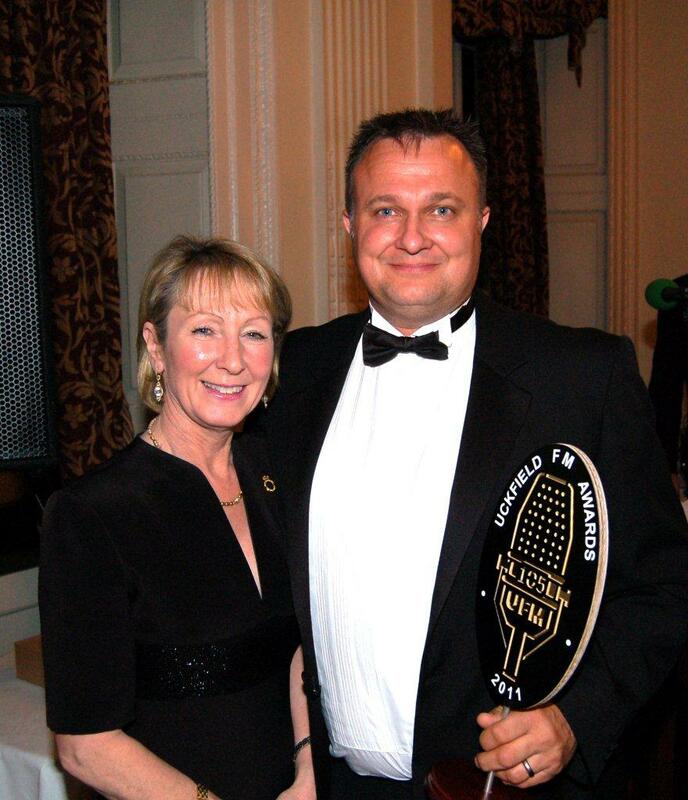 Pictured is Sebastian Bishop (Mr Fluffy) from flooring specialists Fluffy Side Up receiving his award from Kathy Gore for Favourite Commercial, one of the 8 categories. Chris and Julia were delighted Mr Fluffy won this award as they have known Sebastian for some years and indeed he carpeted their office at The Granary. Lawson Commercial let him his first commercial premises at Holbein Place on the Bellbrook Business Park in Uckfield. Also featured are the actual awards presented which were manufactured by Proteus Packaging of Upper Dicker, Nr Hailsham based on the Awards logo and made from cardboard with an aluminium spindle and wooden plinth. Chris said Proteus is a highly innovative design packaging company whose slogan is “Making dreams come true in cardboard’. They occupy buildings originally a chicken farm which we sold them some years ago but which have now been extensively rebuilt. 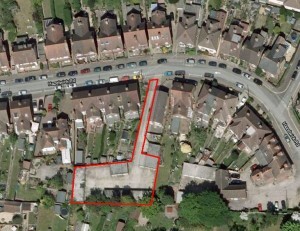 Main ground floor area 5,265 sq ft including some offices. 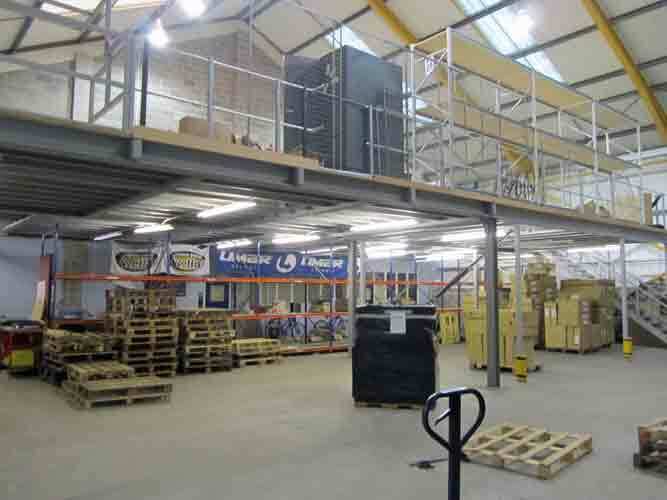 Very useful mezzanine floor of 1,942 sq ft + 1st floor offices in very good specification including some air conditioning. 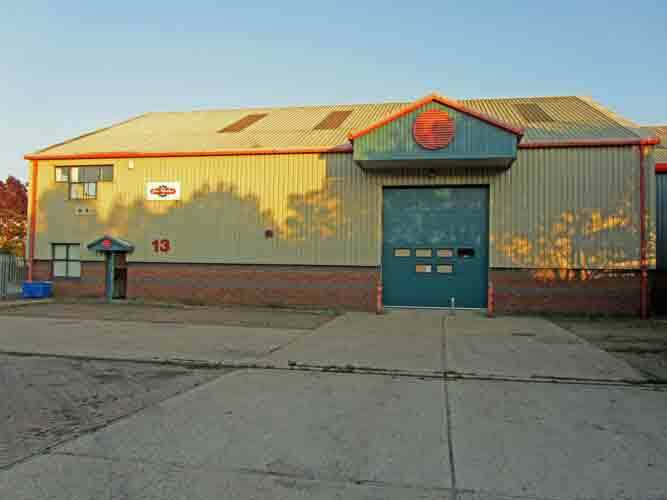 Total overall area 8,078 sq ft with lots of parking and good lorry access. Available on a lease at £5.57 per sq ft. Contact Lawson Commercial for more information on 01825 764488. Lawson Commercial have just been instructed to market this property which was formerly used by the East Sussex Hospital Trust for medical services and would lend itself ideally for the above type of uses in the future. There is great potential to separate the ground and 1st floors to provide a self-contained 1-bed flat which could be rented out or sold. There is parking at the front of the building. The whole property has been redecorated and re-carpeted and is in excellent order. It is available now at £198,500 freehold and viewing is strongly recommended. Call or email for more information. 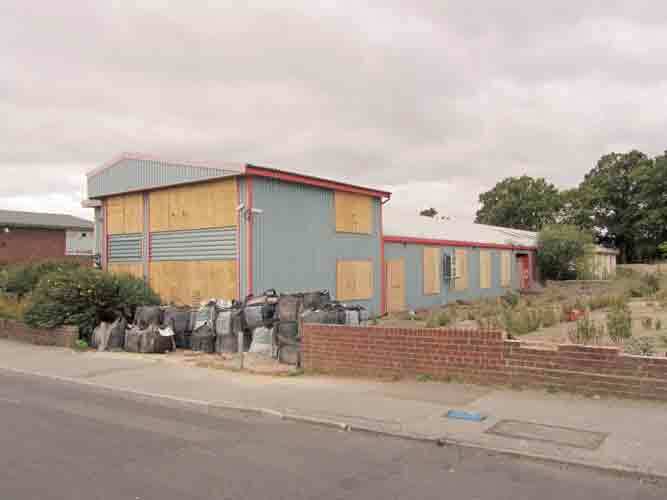 Lawson Commercial have been instructed to sell four blocks of garages, some 20 lockup single garages, only some 10 minutes walk from Three Bridges Station. All the garages are let on quarterly licences at a rental of £8 per week per garage giving a total annual rent roll of £8,320. Bernard Smith of Lawson Commercial who is handling the sale said: ‘There is potential to grow the income from these garages. There are a limited number of garages available in the area from Crawley Borough Council at a rate of just over £10 a week and parking for commuters at Three Bridges Station is subject to a waiting list and costs £750 a year. This is a good investment having good growth prospects and we are looking for offers in the region £125,000 + vat for the freehold interest.’ For more information call 01825 764488. 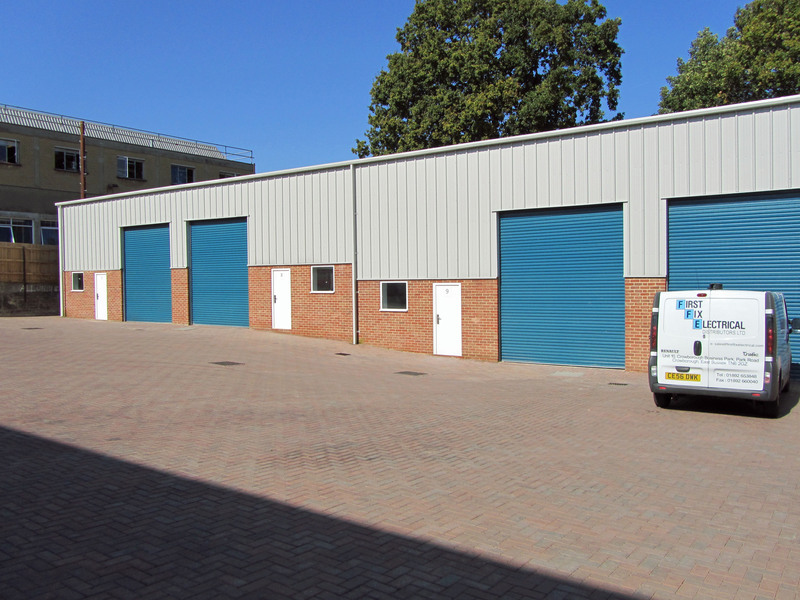 Lawson Commercial have been instructed to market the last remaining units at the new Crowborough Business Park accessed off Park Road and only a short distance from the main A26 Crowborough/Tunbridge Well road. 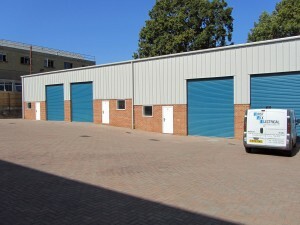 There are 2 units of just over 1,000 sq ft available to rent or to purchase freehold plus a unit of 1,375 sq ft also available to rent or purchase. 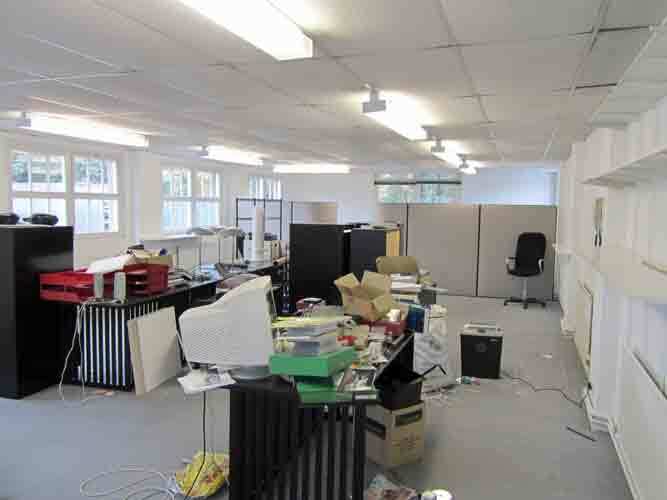 In addition there is a unit of just over 2,500 sq ft available and two smaller units of about 1,400 sq ft available to rent only. Lawson Commercial partner Chris Lawson said: ‘These are very smart modern units, the first to be built in Crowborough for over 5 years, and they offer a good selection of sizes together with excellent eaves heights generally around 19ft with an apex height in several instances of over 20ft. This means that occupiers will have the flexibility to install mezzanine floors subject to planning should they so wish. Thus an excellent opportunity.’ For more information call Lawson Commercial on 01825 764488. Lawson Commercial have sold a delightful Grade II listed character shop which is probably one of the oldest buildings in East Grinstead. 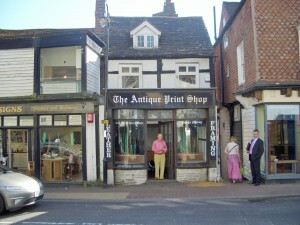 It is believed to have origins dating back to the 16th Century and was formerly The Antique Prints Shop. The property is situated directly opposite the pedestrian entrance to St Swithins Church. The shop comprised some 640 sq ft on 4 floors.